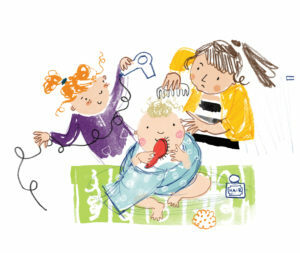 Kasia Matyjaszek is the illustrator of The Fourth Bonniest Baby in Dundee, which has just been shortlisted for the Scottish Book Trust’s Bookbug Picture Book Prize 2018. But who is Floris Books’ latest prize nominee? 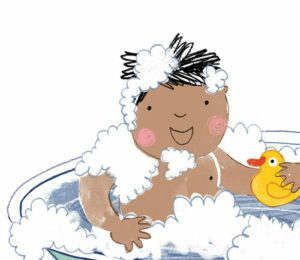 Kasia’s publisher introduces the illustrator behind messy (but adorable!) babies and Dundonian streets. Kasia is an Edinburgh-based freelance illustrator. 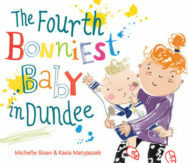 Along with illustrating The Fourth Bonniest Baby in Dundee and This Bonny Baby for Floris Books, she’s worked with Barrington Stoke, Ladybird Books, Templar Books and publishers Dwie Siostry Publishing and Wysokie Obcasy Extra in her native Poland. After starting her first career in architecture, Kasia decided to swap blueprints for brushes. She graduated from the Edinburgh College of Art with an MA in Illustration, and now works there as an illustration tutor. When not teaching at the University of Edinburgh, Kasia runs creative workshops for young children. Kasia recalls drawing avidly as a child. Once her teacher sent a note to her parents saying, “Kasia did not listen during class. She drew silly drawings in her notebook and laughed at them.” She’s now proud to make a living by her silly drawings! To help establish her reputation as a children’s picture book illustrator, Kasia submitted artwork for illustration competitions. She was highly commended in the Macmillan Book Prize and a finalist in both the Picture Hooks mentoring scheme and Clairvoyants picture book competition. Now, she’s shortlisted for the Bookbug Picture Book Prize 2018 with The Fourth Bonniest Baby in Dundee, AND she created the Scottish Book Trust’s competition artwork for next year’s prize. Crocodiles, dragons and confident girls. Kasia lists her main inspirations as naïve art, social realism, and mid-century design. She also loves the new ideas sparked by drawings and comments made by children she meets at her illustrator events. Don’t feel the need to work in sequence – if you get stuck just move on to a different illustration and then go back to the problematic spread when you’re ready. Take a day off, go for a walk or for a long cycle, ideally somewhere close to the sea; all of the good ideas are at the bottom of the sea just waiting to be discovered! This Bonny Baby, a mirror board book, by Kasia Matyjaszek and Michelle Sloan is out now published by Floris Books priced £5.99.